Tantrism along with Tantric literature holds a very important place among ancient Indian literature, philosophy and culture. 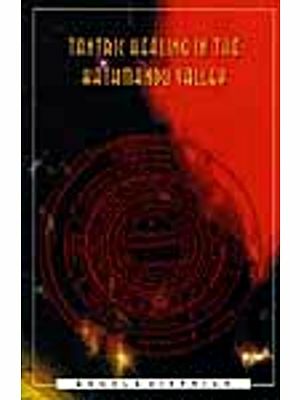 This book is a general study that travels through Tantrasastra, Tantric literature and Indian Tantric cults. The common man still beholds Tantra through the veil of secrecy and mystery. This work is a sincere attempt to reveal to the layman, Tantrasastra and its exhaustive literature. Written in a simple and lucid style, this book makes a good read for both casual and serious readers of Indian sciences, mythology and philosophy. Dr. Prajith JP, the author, is a Ph.D. holder in Sanskrit Sahitya from Sreesankaracharya University of Sanskrit, Kalady, Kerala. He is currently working as Assistant Professor and Head of the Department of Sanskrit, Sree Narayana College, Varkala, Kerala. He was awarded with the Vadikasahityapuraskara by the Kerala Sahitya Academy in 2014, for his work in the vernacular titled 'Tantrasahityam', published by Kerala State Language Institute. He has also written extensively for journals, periodicals and magazines, and presented papers in national and international seminars and conferences. Tantric literature has long been assigned a distinct status and it still enjoys a place of significance in the literary domains of Sanskrit. This work mainly introduces a general idea on Tantra Darsana, the literal meaning of the word 'Tantra', the age of Tantra Darsana, subject matter of Tantra, Tantric Works in South India, Daksinacaras or Kerala Tantra, origin of Tantric culture in South India, Tantric traditions in Kerala, Vedic aspects of Kerala Tantric Literature, some rare Malayalam Tantric works of Kerala, Tantric influences in fine arts, other observances, etc. Tantrasastra pervades virtually every branch of Indian knowledge and thought like the Sruti, Smrti, Upanisads, Puranas, Itihasas, Sankhya, Yogadarsana, Buddhism, Traditional Arts, Literature etc. Two distinct and independent systems of worships, i.e., Vedic and non-vedic, had existed in parallel in ancient India. It was Kullukabhatta, who was the first scholar to give an exhaustive interpretation to Manusmrti and divided traditional Indian philosophy into two branches, Vedic and Tantric. There existed in Kerala many traditions of worships integrally connected with Tantra and Mantra, with each Tantric and Mantric following individually distinct nuances. There have been considerable contributions in the field of Tantric Literature and worship in Kerala. There is, in general, a lot of ambiguity in Tantra and Tantric Literature. The attempt here is to throw light on them from a research point of view. 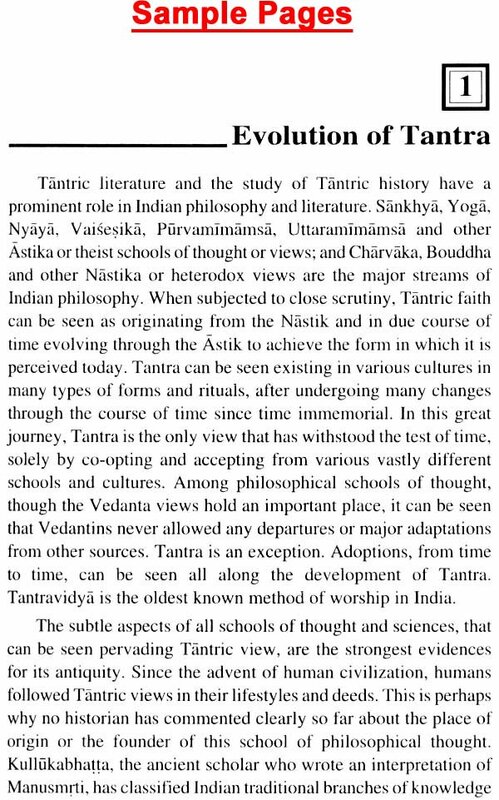 Besides attempting to clear this vagueness, the study also attempts to bring home to the society, the importance of Tantrasastra besides showing how the beliefs, methods of worships and superstitions where integrally linked to the cultural, social and economic milieu of different ages. This study also aims at informing those engaged in related research of the contributions of Tantric literature and its varied research aspects. The first chapter Evolution of Tantra deals with a brief study based on the history of Tantra. 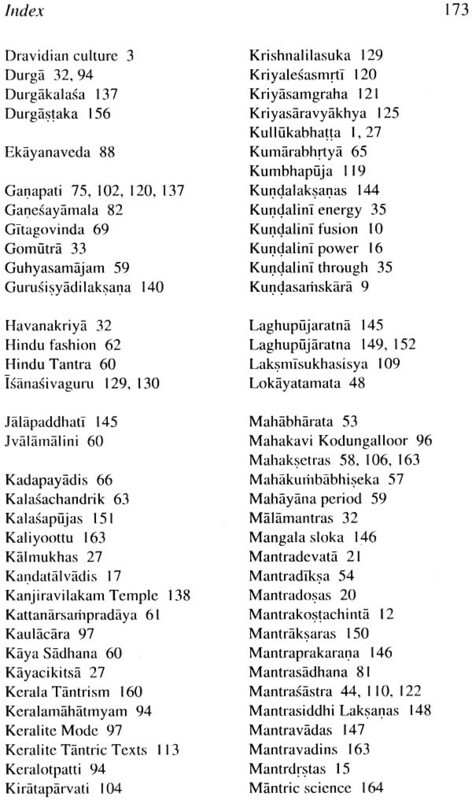 This chapter discusses the various aspects of Tantra like significance of women in Tantric faith; Agriculture, Women; and Tantra Vidya; Women and Procreation; Basic tenets of Tantric faith; fivefold "Ma"kara Systems: Prakrt and Sanskrit; the status of a Guru in Tantra; Description of Tantric sounds; Hymnic theory or Mantratatva; Origin of Mantras in Tantrasastra; Description of Kalas and Bhuta lipis. The second chapter deals with the Vedic Aspects of Tantra - An Analysis. 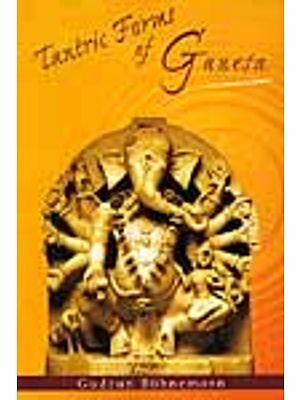 This section describes the influences of Vedic aspects in Tantric Worship; The decline of Vedic deities in Tantra; Vedic influences in the daily routine of Tantrics; Vedic touches in Mantras of deities; Vedic deities and Tantric deities. 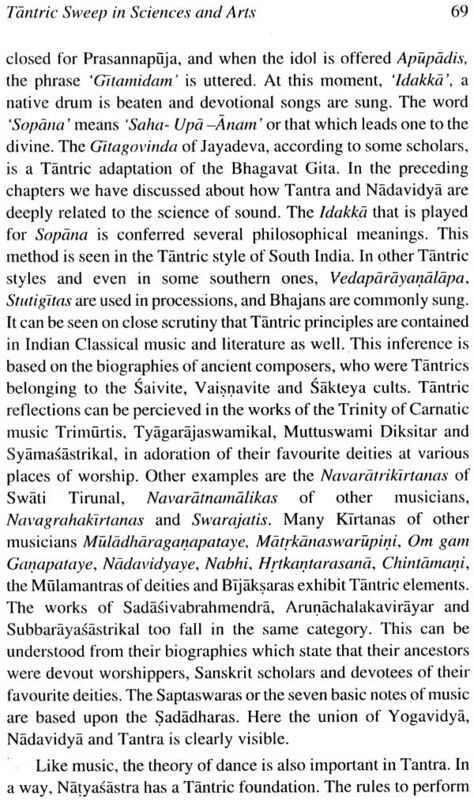 The third chapter describes the Tantric Sweep in Sciences and Arts. This chapter is divided into two parts titled the extent of Tantra in the sciences and epics; and Tantric presence and influence on fine arts. 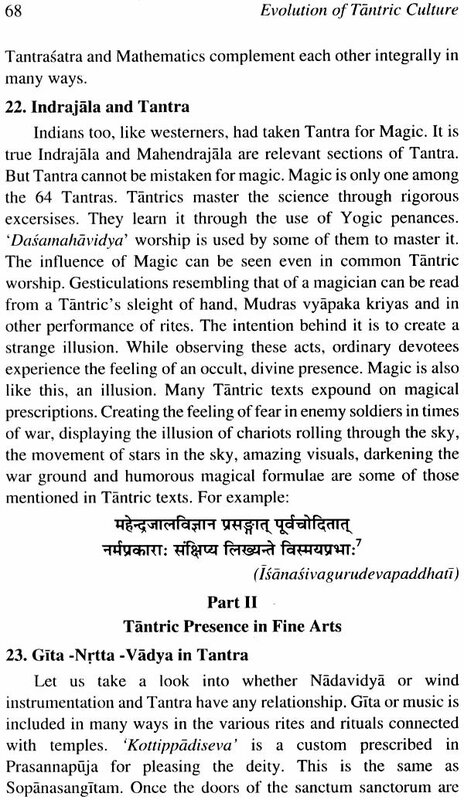 The fourth chapter deals with Tantric Literature - An Overview. 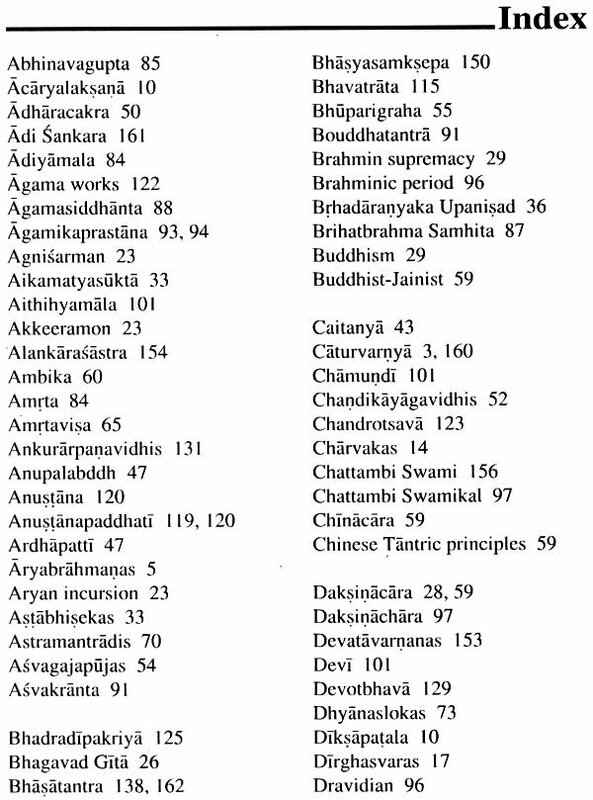 Branches of Tantric literature, Agama and its laksana, Description of Amnaya, Nigamas, Yamalas, Yamalalaksana, Damaras, Rahasyas and Sutras, Paddhati Literature, Samhitas, Saktatantra, Visnukranta, Rathakranta, Aswakranta, Buddhist Tantric Literature are discussed here. 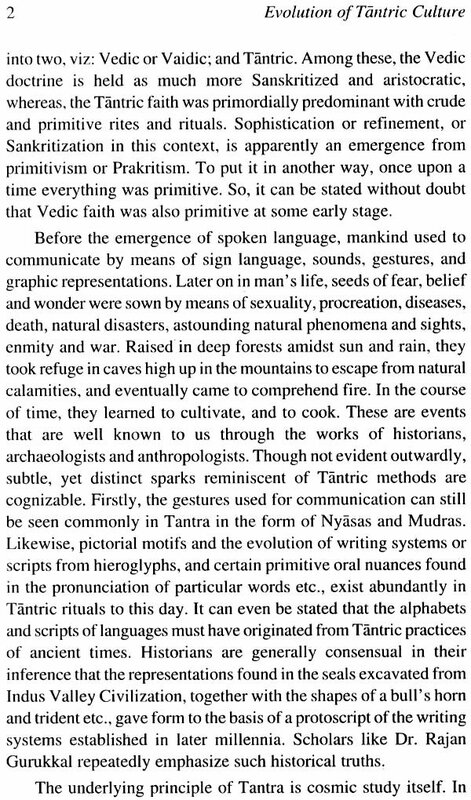 The fifth chapter The Contribution of Keralites to Tantric Culture and Literature - A Study. 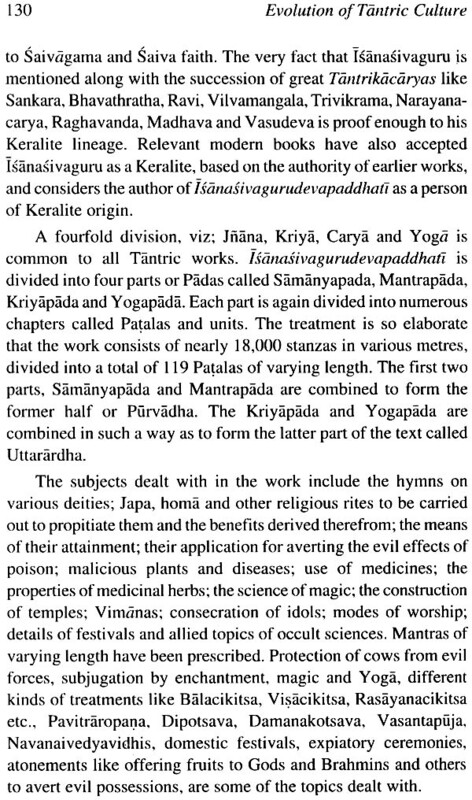 It delineates Tantra, Kerala and Parasurama; Keralite mode of worship; Devaganas in Kerala, 1. Visnu 2. Siva 3. Devi 4. Other deities-Brahma 5. Ganapati 6. Subrahmanya 7. Sasta. 8. Vettakkorumakan 9. Srirama; The Tantric tradition in Kerala; Keralite Tantric Texts-an overview; Mayamata, Prapancasara, Bhavatrata, Prayogamahjari, Visnusamhita, Gopalanustana-kramadipika, Pradyota, Narayanacarya, Rahasyagopala-tantrachintamani, Works of Raghavananda, Tantrasamuccaya, Sesasamuccaya, Anustanapaddhati, (I) Anustanapaddhati (II), Tantrikakriya, Anustanasamuccaya, Anustana, Saivagama-nibandhana, Tantraprayaschitta, Kriyalesasmrti, Kriyasamgraha, Kriyasara, Tantrasarasamgraha, Tantrasarasamgrahavyaghya (Mantravimarsini), Soubhagyamanjari, Tantrarajavyaghya, (Manorama), Silparatna, Prayogasara, Srikrsnatantra, Sivachandrika, Skandanustdna- samgraha, Nrttaranga-jirnoddhdravidhi, Narthanarangana-vikrtavydghya, Vaisnavanustanakalapasamgraha, Saivanustana kalapasangraha, Vaisnavanaveekaranaprakara, Bhadradipika, Tantrasara, Mantrasara, Daurganustanakalapasamgraha, Laghutantra-samuccaya, Kalasa chandrika, Upahara-prakasikavyaghya, Tatvaprakasikavyaghya, Srividyamantra-bhasya, Isnasivaguru-devapaddhati otherwise Tantrapaddhati; An assortment of Sanskrit works on Tantra; Important Malayalam works on Tantra-Putayurbhasa, Kuzhikkattupaca, Saparivaram-pujakal, Tantradarpana, Durgakalasa, Bhasatantra, Saradatilaka. Tantraratna, Tantraratnavali and Laghupujaratna, the presence of poetry in Tantric Texts - An analysis are also introduced in this chapter. The sixth and concluding chapter tries to sum up the findings of the study. Spread over six chapters, this study amply covers several subjects, some concisely and others in appropriate detail. Above all, Tantra as a science, being esoteric and secretive in nature, every effort has been made to present the subject matter in a simple and lucid manner to facilitate easy comprehension.